my lvl 12 bard has no problem with them the more they stone the more i hit. but they r hard to find one day saw 20 next day saw none what gives?? 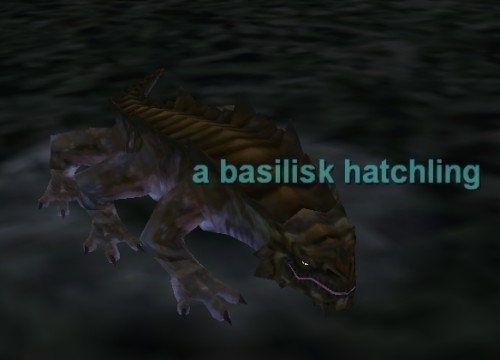 Basilisk hatchlings are also found in Nektulos Forest. Tried to take one out with a level 8 wizard... resists, resist, get stunned, resist, resist. Thank goodness for Root! Run away! The main part that bugs me is that these guys have to be killed for the Tranquilsong bracers. And I have yet to really even try to kill these guys... mostly because they're impossible to find. I'm a lvl 12 Druid and I can't kill one of these suckers without like 5 other people. These are seriously difficult beasties... only go after them in grps. RE: Totally wrong lvl here! Don't think so - They are dark blue to my lvl 9 HE chanter. I've killed a couple of these, with just my lvl 9 spells & Pet. HE Enchanter of 9th season. AB.